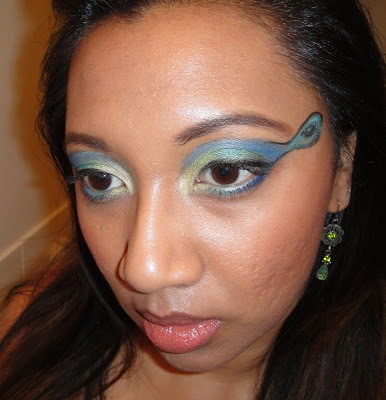 The Made Up Maiden: Peacock Themed Makeup Look. Happy Hump Day! Gee, this week is flying by! This is going to be a short and sweet post as I'm quite exhausted, so I won't go into too much detail. 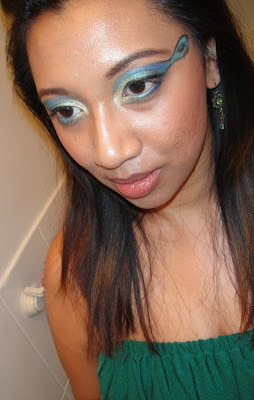 I did this quick and easy look for the weekly makeup tag over at Aqeela's blog, but I was short of time (and energy) so I couldn't put in as much effort as I'd have liked. It's a little more vivid in real life but the camera is washing out the colours a little. 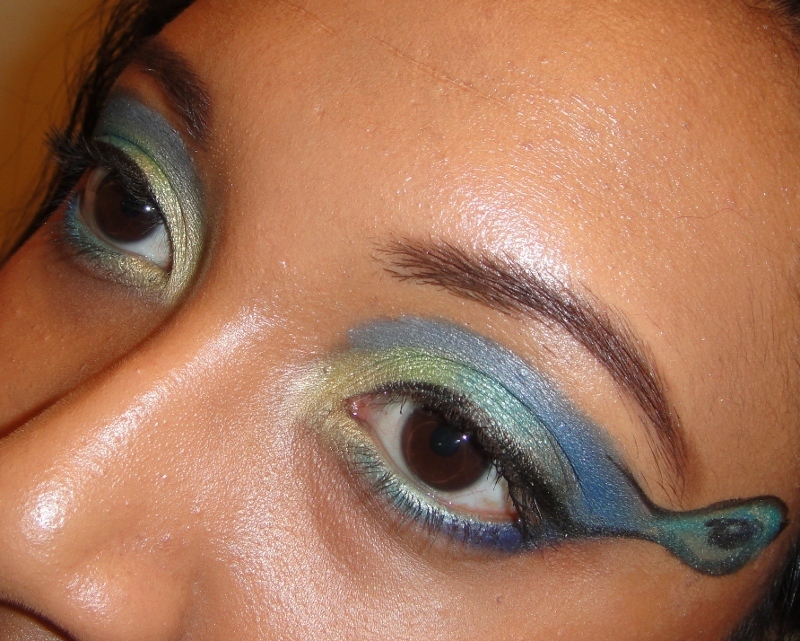 I think I used about 6 different shades to create this look but it's not really very noticeable! 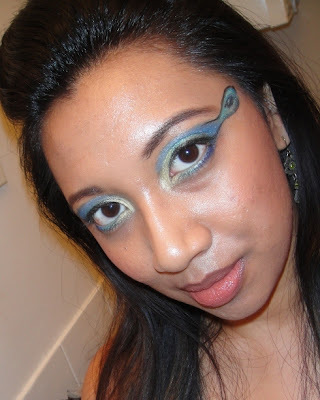 I tried to freehand a little peacock feather eye in the outer corner of each eye but I don't think it turned out too well, lesson learnt for next time! I also just realised I don't have a deep blue eyeshadow, perhaps that's a good reason to go shopping? I will have to love you and leave you now, as this beauty blogger is desperate for some beauty sleep! 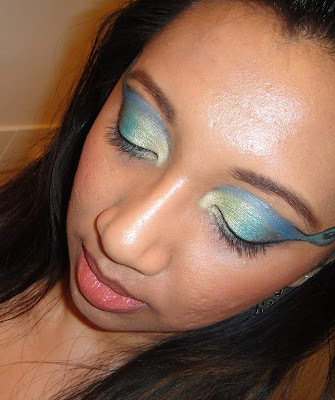 Don't forget to visit Aqeela's blog and check out the other makeup looks! I hope you enjoyed that, lovelies! If there's any particular shadow colour combination you'd like to see, I'd love to hear it; just leave me a note in the comments and I'll see what I can do! Absolutely gorgeous! I wish I had made more of an effort now! Thank you! Aw, I loved your look anyway, I think we are our own worst critics! Oh, thank you so much, Ingy, your comments always put a smile on my face! I love the bright colours you used! It looks gorgeous lovely! You are inspiring me to do some FOTDs again! Aw, thank you, dollface (I think we actually are visiting each other's blogs at EXACTLY the same time)! Please do, I do miss your EOTDs and FOTDs! I just got LORAC's new pro palette so I aim to do one tomorrow! Would you actually wear this out? Very artistic! Do you wear these looks out? I don't think I'm quite bold enough! Love those colours. If that's washed out, the look in real life must have been freakin amazing! I love it. I would love to do that just on my eye and not extend out. I like to add a bit of colour through my eye makeup but looks like I need to practise to be able to make it look so nicely blended. And I think you definitely that colour eye shadow so when your not so tired hit the shops. visiting from Blogs and PR #TUST! February 2013 Lust Have It Review. Valentine's Day 2013 Inspired Nails!